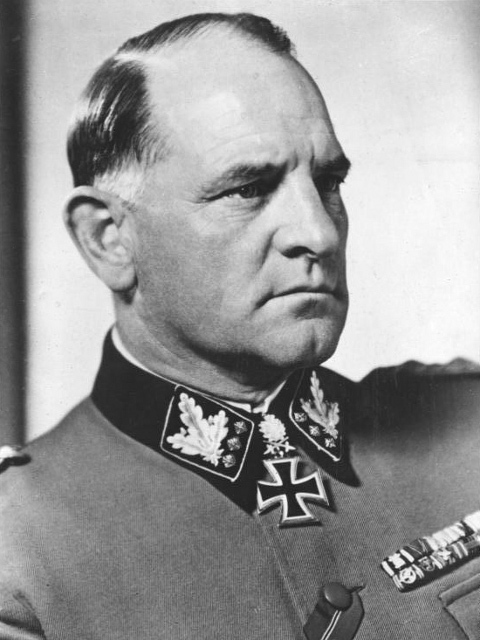 The commander of the Division Leibstandarte and later the I SS Panzer Corps, Sepp Dietrich was born in Hawangen, near Memmingen in Bavaria, on 28th May 1892. A decorated veteran of the First World War and recipient of the Iron Cross first class, Dietrich was a relatively late member of the Nazi party, joining in 1928 after stints as a policeman, customs officer and petrol pump attendant in his native Bavaria. Dietrich’s rise up the party ranks was quick and impressive, and by 1931 he was already an SS-Gruppenführer. He became the commander of Leibstandarte SS Adolf Hitler (LSSAH) soon after the Nazi seizure of power, Dietrich quickly established himself in the party hierarchy, and played a major role in the purge of the party in June 1934, known as the Night of the Long Knives. By the start of the war in 1939, Dietrich had established himself as a military commander – though a complete contrast to Prussian officer tradition. While he was an excellent motivator and a competent leader, it was clear that Dietrich was not an a military genius. His tactical acumen was often dismissed by his regular Army contemporaries, with the great Army Field Marshal Gerd von Rundstedt describing him as “decent but stupid”. Tactical failings notwithstanding, there was no disputing Dietrich’s bravery. He was a man who not only got things done, but had been able to earn the genuine respect of his subordinates with hands-on approach. Unlike many of his contemporaries, Dietrich was often seen leading from the front. Even among his fiercest critics, it was widely accepted that he was a popular commander. Dietrich had more crucially earned the trust of Adolf Hitler, and as a result was able to get away with disobeying direct orders from the Führer when the situation demanded it. Dietrich led the Leibstandarte during the French and Balkan campaigns, and by 1940 had already earned the coveted Ritterkreuz. As the Germans turned eastwards in 1941, Dietrich remained, leading from the front. He was awarded the Oak Leaves to his Ritterkreuz in the winter of 1943, and the Swords in the spring of 1943 as the war started to turn against Germany. When his unit was redeployed on the Western front in the late spring of 1944, Dietrich was appointed commander of the I SS Panzer Corps, and after that the 6th Panzer Army that would see action in the Ardennes and the famous Battle of the Bulge – where men under his command were involved in the massacre of American troops in Malmédy. On 6th August 1944, two days before the death of Michael Wittmann in Normandy, Dietrich was awarded the Diamonds for his command during the Normandy campaign. On the same day, he was conferred the rank of SS-Oberst-Gruppenführer und Panzer-Generaloberst der Waffen-SS. By 1945, even the old soldier Dietrich had stared to grow weary of Hitler’s leadership. He threw everything into the fight with dwindling resources and was forced to retreat near Vienna, resulting in his men being ordered to remove their “Adolf Hitler” cuff titles. According to some reports these were all placed in a chamber pot, with the order that it be returned personally to the Führer. A day after the final ceasefire in the West, Dietrich and his family surrendered to the Americans in Austria. As the established commander of the Leibstandarte, Dietrich was charged with a number of offences at the Nürnberg trials, including the massacre at Malmédy. Initially sentenced to life imprisonment, this was later reduced to twenty-five years following testimony from fellow officers. In the end, he was a free man after serving ten years. This did not last for long, as German authorities were quick to charge him, rather bizarrely, for his role during the Nazi infighting during the Night of the Long Knives. Having served most of a nineteen-month sentence, Dietrich was finally released on 2nd February 1958. Dietrich remained close to his men after his release, and would play a significant part in the formation of the HIAG (Hilfsgemeinschaft auf Gegenseitigkeit der Angehörigen der ehemaligen Waffen-SS, or Mutual aid association of former Waffen-SS members). Despite retaining firm links with his former comrades and fighting for their corner, Dietrich steered clear of any postwar political ambitions. Sepp Dietrich died of a heart attack in Ludwigsburg, Baden-Württemberg on 21st April 1966 at the age of 73, and his body still rests in the town’s Neuer Friedhof cemetery today. The respect among his subordinates and peers remained solid until the end, and more than six thousand people would attend his funeral.